Physics professor Peter Sheldon (center, left) shows off his championship belt. As the crowd erupted in deafening cheers and chants of his name, physics professor Peter Sheldon accepted the championship belt as winner of Randolph’s first-ever Academic Smack Down Wednesday night. Wes Fugate, vice president and chief of staff, welcomes the audience and introduces the contestants. 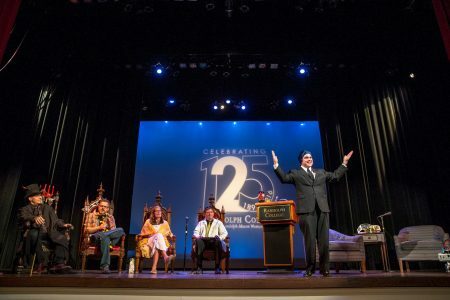 Sporting a lab coat and bringing his own robot, Sheldon represented the sciences in the playful debate between disciplines, which was designed to help students understand the value of a broad, liberal arts education. 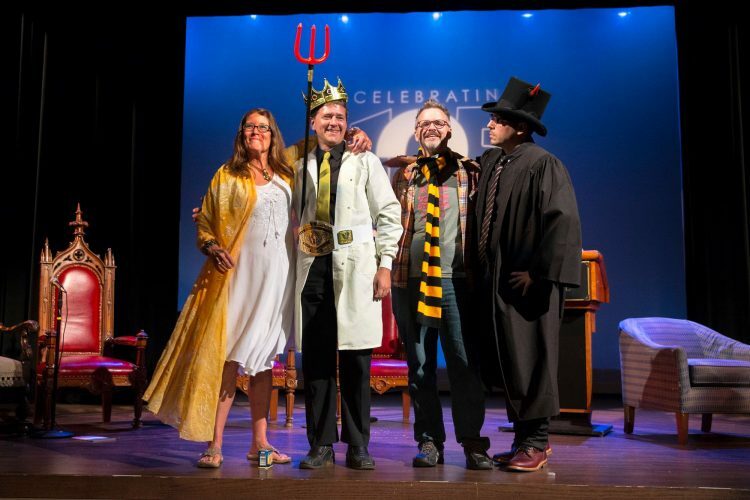 He faced off against two other faculty “tributes” in the contest—sociology professor Danielle Currier, who represented the social sciences, and English professor Gary Dop, who represented the arts and humanities. Gordon Steffey, the Barbara Boyle Lemon ’57 and William J. Lemon Associate Professor of Religion and Philosophy, played the role of devil’s advocate and made the case for why each discipline should be eliminated. Wes Fugate, vice president and chief of staff, played the role of host and moderator, introducing each contestant to the audience. First to the podium was Sheldon, who quoted the words of the opening credits for the popular TV show, The Big Bang Theory. During her arguments, Currier made light of the fact that she was the only woman on stage versus three white men. She named the many departments that comprise the social science division, including communication studies, economics and business, education, political science, sport and exercise studies, psychology, sociology, and the American Culture Program. “Every discipline has a place here. That’s the beauty of the liberal arts,” Currier said. “But my division is where you get to have fun. We study the day-to-day life of people and how they communicate. In fact, we have taken many parts of the other divisions, in fact the best parts, and we have evolved them and made them part of the best division. Gordon Steffey embraces his role as devil’s advocate. On his way to the podium, Dop stomped the candy Currier threw to the crowd and roasted the other two disciplines while emphasizing the arts’ and humanities’ contributions to society. 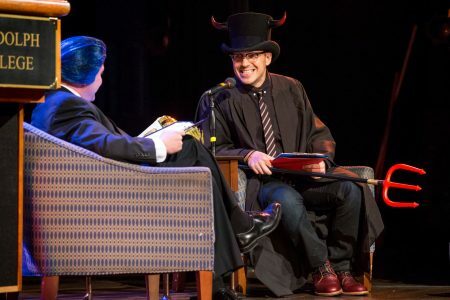 Wearing a horned top hat and wielding a plastic pitchfork, Steffey spent his time discrediting and poking even more fun at each of the academic disciplines. The champion was decided by audience applause, and the first to be eliminated were Currier and Steffey. By just a marginal difference in applause decibel levels, Sheldon was declared the winner over Dop.